Light-weight, passive reflectors for use with robotic Total Stations. For efficient operation without the need for directing the reflector toward the instrument, a 360° prism is required. This type of reflector consists of six corner-cube prisms joined together. The arrangement allows the measuring beam to reflect directly back to its source from any position on the prism set. The even distribution of the prisms provides similar offset and accuracy readings from any side. Due to its small size, this low cost alternative provides the greatest pointing accuracy of 1.5mm. However, the GRZ101 has restricted functionality with the TPS Power Search, and a shorter ATR range than the standard size reflectors. 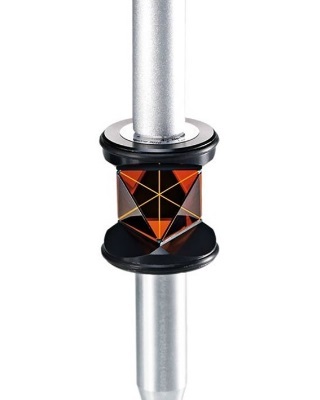 The GAD103 Adapter allows the mini reflector to be mounted on all survey poles having a Wild pin stub. The adapter provides the correct offset in order for the prism height to be read directly off the pole scale.